Another day’s work yields a better understanding of our colonial redan. As on Monday, the crew worked slowly and carefully through the materials already exposed and recorded their findings along the way. The results may be less dramatic than those seen in the past few days, but we made some interesting and subtle observations along the way. First, Martha Zierden and Blair Stec have been working for days on a small controlled unit, from the twenty-first century street surface to the bottom of Trench 1. It’s quiet work that hasn’t garnered much attention, but late in the afternoon Blair reported a discernible stain forming a line in the soil just east of two wooden posts. These features appear to be parallel to the line of the redan, approximately sixteen feet northeast of the northern flank of the wall. Hmm, might this be evidence of the moat that was cut on the outside of the redan (and along the entire length of East Bay Street) in 1745? That moat, which was filled at the end of 1764, was ordered to be twelve feet wide, so we might have found a trace of its outer edge. 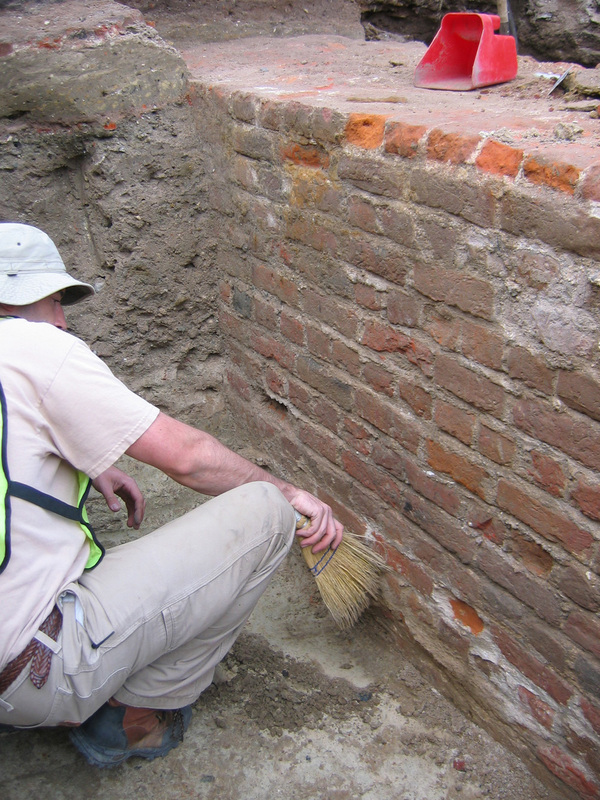 Meanwhile, back at the brick redan wall, Eric Poplin spent some time exploring the footings of the outer face of the exposed wall. Standing in front of the section that is three and a half feet wide, Eric discovered that the wall expands to five feet wide at a depth of approximately six feet below the present top of the wall. As you can see in the photo above, we have finally reached the water table at that depth. Reaching into the muddy water as far as my arm would reach, I could feel the five-feet-wide wall continuing straight downward to an unknown depth. Perhaps we’ll have time to explore the wall’s foundation next week. 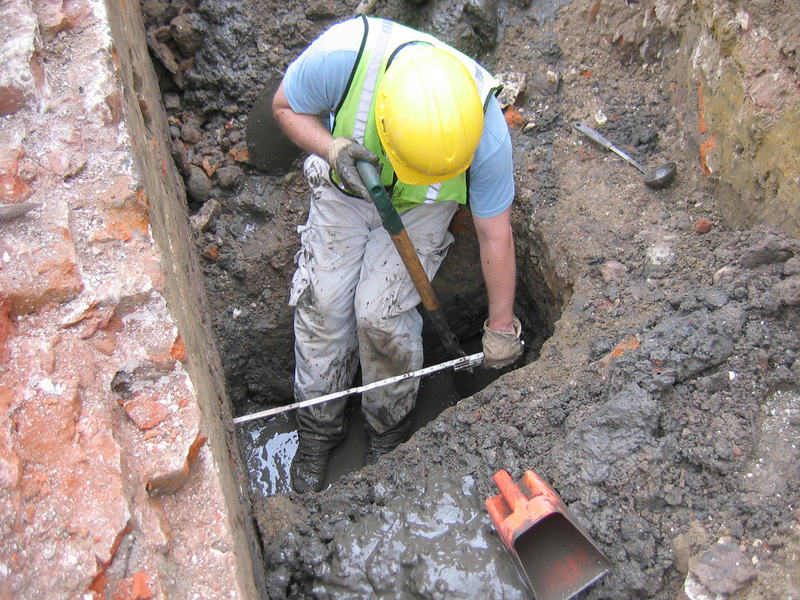 Rest assured that the final archaeological report will include precise measurements of these features relative to the current street grade. Ron Anthony and Jimmy Lefebre spent much of the day carefully removing and screening the soil from the top of the exposed redan wall. Their work revealed a fairly uniform surface that doesn’t really seem to reflect the known demolition of the brick mass above it. The wall in the photos here is three and a half feet wide at the top, but the missing brick mass that once stood above it (actually scattered in front of it now) may have been about half that width. 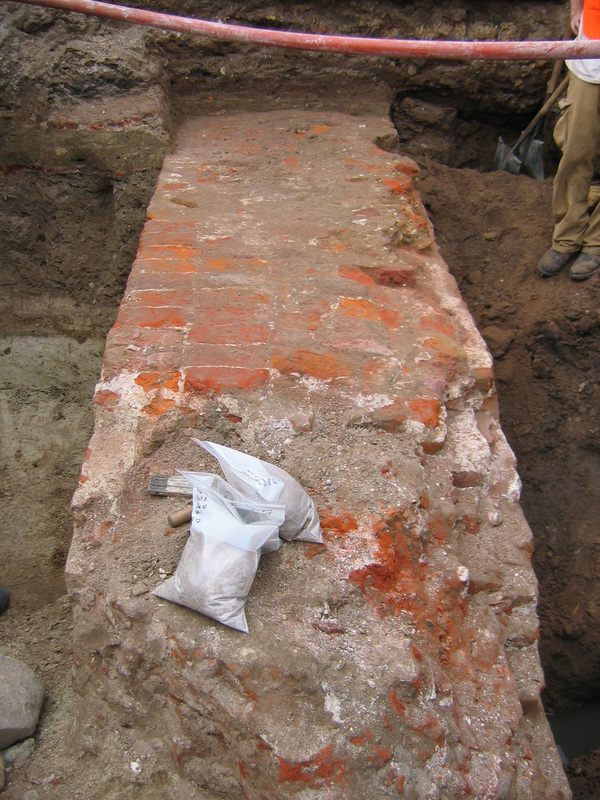 It’s interesting to note that the top of the demolished redan was until today covered with a layer of clay and sand, apparently placed there to create a level surface for the brick floor of the Lower Market that was extended over it in 1786. 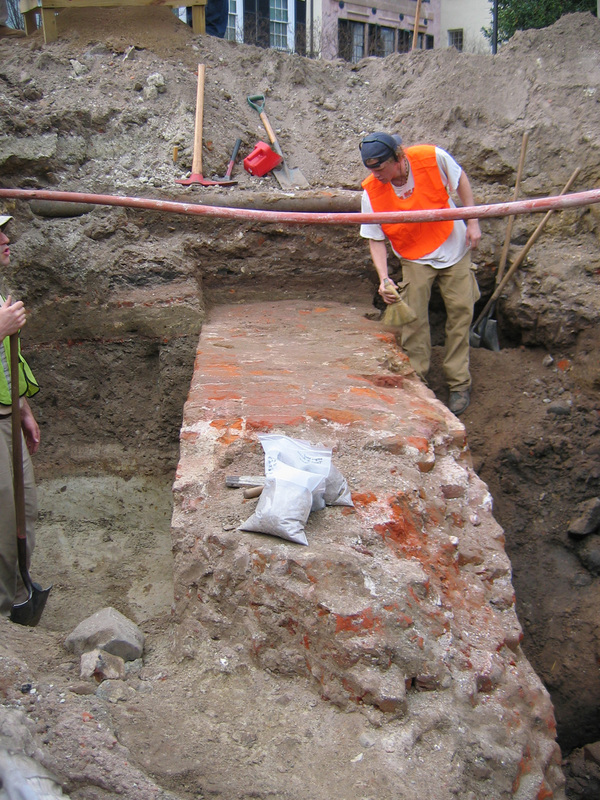 Andrew Agha has spent the past two days excavating a controlled unit behind the exposed section of the redan wall. In contrast to the area outside of the wall (on the Cooper River side), which is full of rubble and all sorts of debris, the area inside the wall contains a large amount of relatively clean sand, suggesting a very different sort of history. I look forward to talking further with Andrew to learn more about his thoughts on this topic. 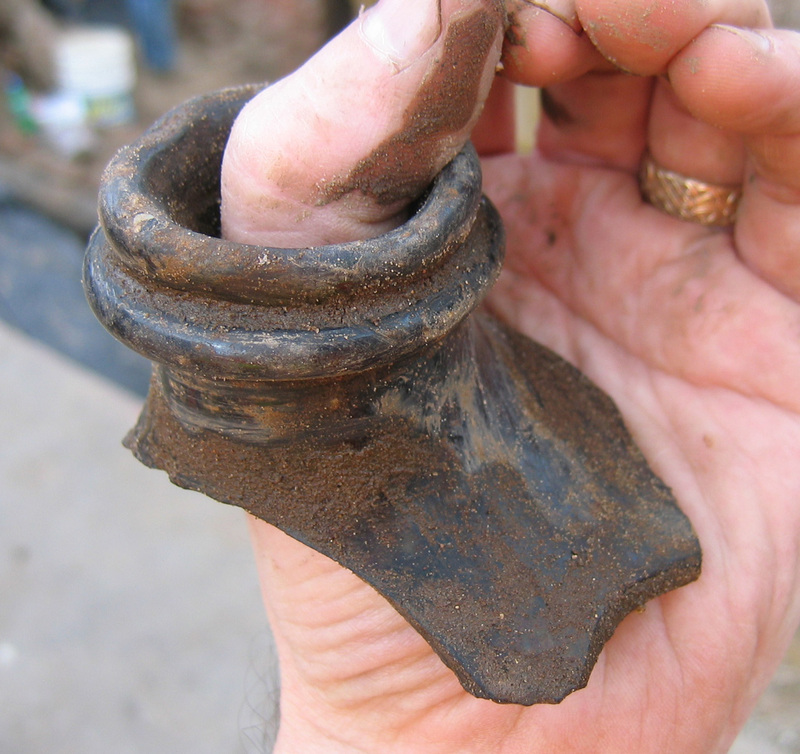 Last but not least, volunteers continue to find fragments of the past in the dirt they’re screening. 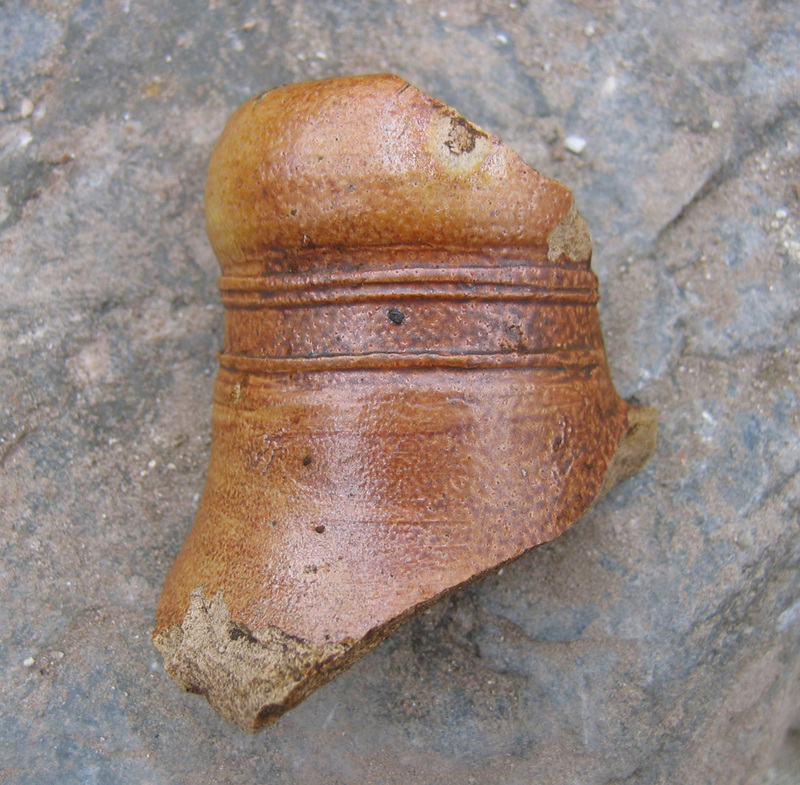 We’ve found the shattered fragments of hundreds of old bottles, but today I was intrigued by the mouths of a couple of jugs—one ceramic and one glass. I think the size and proportions of these objects are impressive, and I hope you agree! This dig will continue through Wednesday, January 16th. If you’d like to volunteer, or to contribute towards sustaining this project, contact Katherine Saunders at (843) 723-3646, or email her at ksaunders[at]historiccharleston.org. Unbelievable how quickly this work has progressed. Many thanks for your excellent progress reports. A hat tip to all the volunteers and experts involved. I never knew that things like that really happen, thanks for your post.